Gluten Free Crêpes. Serve them sweet or savory! Gluten free crêpes are so, so easy to make, and make an everyday meal extraordinary! 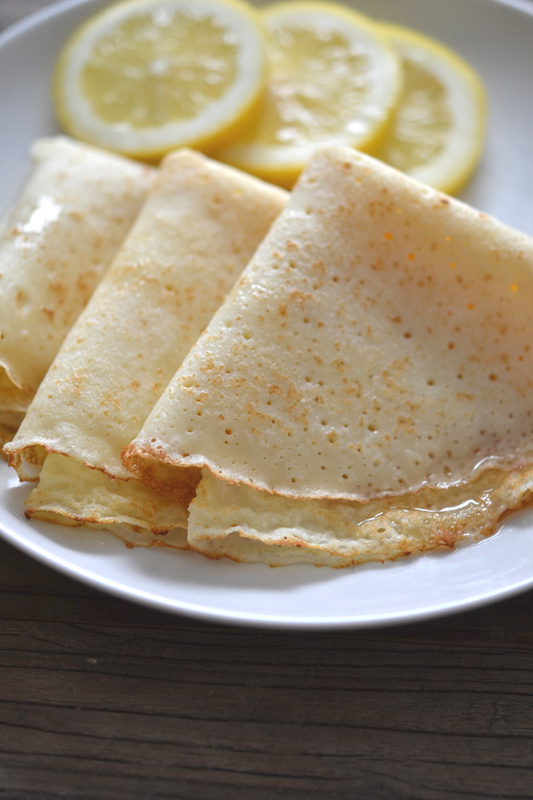 Gluten free crêpes are simple, French-style pancakes. Light, airy and delicate but not fragile, these pancakes can be served sweet or savory. I often serve them simply, with roasted chicken and vegetables and a bit of cheese. Simply fill the crêpes like you would a taco or burrito before serving warm. You can make these crêpes up to a couple hours ahead of time, cover them, and then serve them at room temperature. They’ll still be soft and pliable and delicious. Feel like freezing them? You can do that, too. Place the stack of pancakes in an air-tight zip top bag, and freeze on a flat surface. Defrost by placing them in the refrigerator or kitchen counter. You can warm them in a hot, dry skillet, or add your favorite fillings and warm them in the oven or microwave. The consistency of the batter should be like half and half: thicker than whole milk, thinner than heavy cream. Swirl the batter around. You get good at it—fast. The first pancake is always for the cook, as it may be rather unfortunate looking. It will still taste great! To make “rich” simple syrup, which is best for drizzling (and for using in cocktails), simply combine twice as much sugar-in-the-raw (granulated sugar works, too, but sugar-in-the-raw dissolves more fully) as water in a saucepan. Whisk to combine completely. Bring to a gentle simmer over medium heat, and continue to simmer gently until the sugar is completely dissolved and the sugar has just begun to thicken (about 3 minutes). Transfer to a heat-safe container to cool completely. Store covered in the refrigerator. To make simple syrup, the process is the same, but the ratio of sugar to water is 1:1 instead of 2:1. To make lemon syrup (“rich” or not), replace 1/4 of the water with freshly-squeezed lemon juice. To increase lemon flavor, add a strip of lemon rind after whisking together the sugar, water and lemon juice and keep in during simmering. Discard before storing. Make them tonight. I bet you have all the ingredients right now. They’re a great alternative to traditional pancakes, and more versatile, too! In a large bowl, place the flour blend and salt, and whisk to combine well. In a separate, small bowl, place the eggs, butter and milk, and whisk to combine well. Create a well in the center of the flour and pour in the wet ingredients. Whisk until very well combined. The batter will thicken a bit as you whisk. For best results, cover the bowl and place the batter in the refrigerator overnight or for up to 2 days. Before using the batter, remove it from the refrigerator, whisk until smooth, and allow it come to room temperature. The batter should be about the consistency of half and half (thicker than milk, thinner than heavy cream). Transfer the batter to a large spouted measuring cup. Heat a heavy-bottom nonstick 9 inch skillet (or a well-seasoned and lightly greased 9 inch cast iron skillet) over medium heat for 2 minutes. Holding the warm skillet just above the flame, carefully pour about 5 tablespoons (a bit more than 1/4 cup) of batter right into the center of the skillet and swirl the pan to distribute the batter evenly across the entire flat surface of the pan. Once you get a rhythm going, you should be able to begin swirling as soon as the first drop of batter hits the pan. Cook over medium heat until the edges and underside of the crêpe are lightly golden brown (about 90 seconds). With a wide spatula (and/or your fingers, carefully), turn the crêpe over and cook until the other side is lightly golden brown (about another 30 seconds). 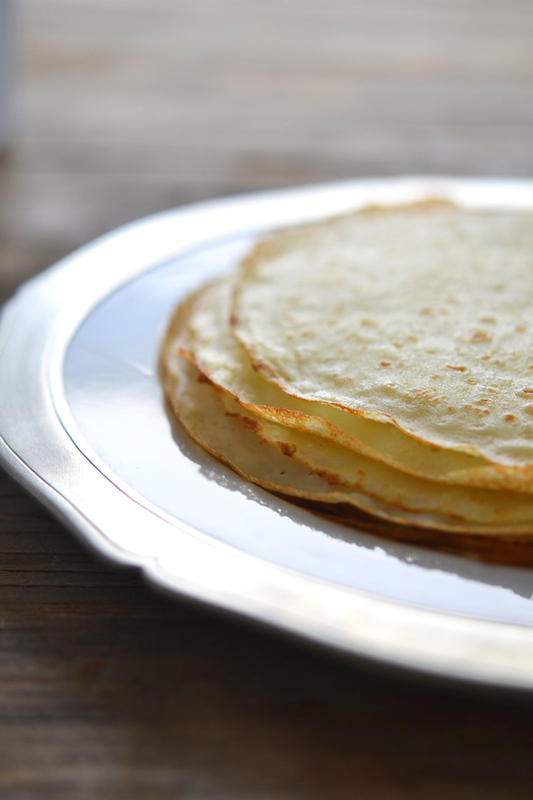 Slide the crêpe out of the skillet onto a parchment-lined plate. Repeat with the remaining batter, stacking the finished crêpes on top of one another. The crêpes may be covered well with a moist towel and kept at room temperature for about 2 hours until you are ready to serve them, or wrapped tightly in freezer-safe wrap and frozen until ready to use. Defrost at room temperature, and refresh the crêpes in a warm, nonstick skillet for a few moments per side, per crêpe. Originally posted in 2013. Recipe and photos mostly unchanged; video new. Egg question for you! What is the weight of egg prior to cracking it open? I get eggs from my son and their weight varies greatly. I could waste eggs trying to get to the correct weight. Love that you provide weights for ingredients the only way to bake! Thanks looking forward to making your Paleo recipes. I made these last night, they are lighter and better than the ones I used to make with glutenous flour. I filled them with honey sweetened mascarpone and topped them with blueberry sauce, yum! They were so good I ordered a Cuisinart electric crepe maker, we’ll see how that works out. For sugar substitutions I think it depends on the recipe. Some can take a liquid sweetener like honey, agave or maple syrup quite well if they have enough dry ingredients to balance out the added moisture if you don’t mind the finished product being slightly more dense if it’s a baked good. I’ve made a simple syrup with agave many times and it works well. I do need to reduce the amount of water to get the correct consistency. For breads I find you can easily substitute any of those sweeteners you mentioned with great results. You might need to reduce slightly another liquid ingredient (water or milk) or add a touch more flour. Other recipes, especially those with a high ratio of sugar or no other liquid ingredients won’t work as well and I’d try another granulated sweetener like coconut sugar (more of a brown sugar flavor, slightly less sweet), erythritol or xylitol or one of those in combination with stevia (I have great luck with 1/2 erythritol and 1/2 sweetness equivalency of stevia–it does not measure anywhere near what sugar does, it’s very concentrated so you miss out on the “bulk” sugar gives and using too much can lead to a bitter taste. I’ve got a dairy, gluten and sugar free daughter and a type 1 diabetic son so we do a lot of recipe adaptation at our home. It takes some experimentation to get your favorites recipes to work correctly, so please be patient with yourself and try very small batches at first to keep frustration to a minimum. Good luck! Hope this helps. Mmmmm! Can’t wait to try these. I was hooked from the get go, and then I saw the lemon syrup and I needed them even more! I’m not drinking regular milk and need to substitute almond or coconut. Which is better for crepe? I’d go with unsweetened almond milk, Deorah. I made these last night – extremely easy. But the initial batter has a ton of lumps. took a while to smooth them out. they were sooo delicious, soft. It’s interesting to me that 1CUP of this gum-free flour blend is not 140g, but 245g ! can this gum-free blend be used for general baking? and if so, should it be 245g/CUP always? Oh my gosh, superfcbear, you just caught a dangerous typo! The correct weight of flour is, in fact, 245 grams, but the corresponding volume measurement is 1 3/4 cups (not 1 cup)! 1 cup of the flour blend is, indeed, 140 grams. I have corrected the error. So sorry about that! Oh, and if your batter has a tendency to start out lumpy, just incorporate the liquid a bit at a time, first forming a paste. Or, just blend in a blender. I can’t wait to try these as soon as I get the right flours. Superfine white rice flour isn’t something I have on hand. Thank you for the recipe! 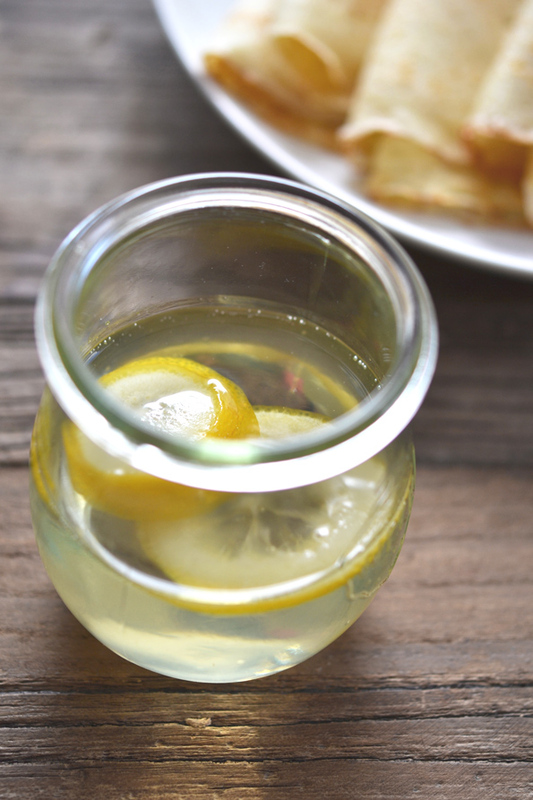 I would love to know how to make lemon simple syrup…wish I knew how to make lemon curd as well. Please tell me how you make your lemon simple syrup. I love lemon and I love crepes. Maybe I’ll do a post on various types of simple syrup (varying proportions create syrups of varying thicknesses, good for different things), if there’s enough interest? Yes yes yes please. I’m thinking these r great in cocktails too right? Also these creeps look awesome. My great grandma made a Hungarian version very similar she called pah-la-chink-kas. I miss them since going gf and miss her even more. She served them w jam or jelly and powdered sugar. Sometimes cinnamon sugar too. She was such a good swirler and rocked 2 pans at once for us kids. I can close my eyes and see her standing at the stove and swirling and dipping into the batter w a small ladle! Thanks for the happy memory! I love simple syrup in all kinds of flavors! I store it in the freezer in freezer jam containers, and scoop some out as I need it. (it freezes to a slushy consistency) I even made sweet and sour mix a few months ago. I am always up for new ideas for things like that, so please do share away! If you are having trouble baking yeast bread, Caisey, I would suggest reading this blog post about baking the best gluten free bread. Generally, though, the issue is one of three things: (1) time (not allowing it enough time to rise – especially with pizza dough you will not likely overproof, so that’s not a worry), (2) a too-starchy flour blend, like King Arthur or Tom Sawyer (or Trader Joe’s all purpose, which I think is just white-labeled King Arthur), which may rise little if at all, or (3) temperature/humidity of the rising environment. It is very unusual for the yeast itself to be the problem, particularly if it is within its freshness date and hasn’t been left open & outside the refrigerator.